Photo: My older son, who is on the spectrum, took this picture of his little brother. 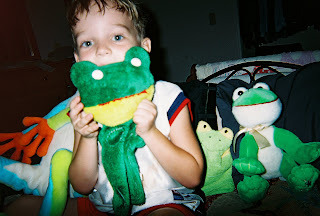 My youngest, five and not on the spectrum, understands my older son's love of frogs and loves to play "froggys" with his brother. He also understands "silly" (inappropriate) behavior and temper tantrums (meltdowns). However, I wonder how much he understands about autism. How much should I tell him? What should I tell him? A Different Scene: Almost 9 a.m. this morning a mom, me, is walking with a five-year-old boy through the local elementary school playground to car after dropping off her older son at his special education class. Please note that the school mentioned in the following conversation is the one my son attended last year. There seems to be one special education class per elementary school in the six elementary schools in our district. The classes vary in their age and ranges of disability. This means a few school switches are necessary as a child in my local education system ages. Five year old: "Next Year I won't be going to Rosebush school like "C" did at my age. Me: "No you won't. You'll be going here. You won't go to Rosebush like your brother. Your brother needs to go to a special education class to help him get through school. You won't need special education like your brother. Five year old: "Yeah, you said that last time." Me: Silent but thinking, "I did?!" I probably did say something like that to him before, but blocked it. Communicating his brother's disorder to my younger guy gives me great anxiety. I want to make sure I tell him properly and do more good than harm. I'll probably be looking at some children books on the subject soon. In the meantime, I found a great link where helpful information can be found. The document is titled "Helping Siblings Understand Autism and Encouraging Positive Relationships." The weakness of the document is that it goes more into when to talk about autism rather than how to explain the disorder. What I do like about the information on this link is that the author addresses how perceptions of the disorder change as the sibling ages--from early childhood to adulthood. The 'what' and 'how' questions are the tricky ones. I always think it's good to be open but at the same time you don't want to confuse things or talk above the sibs level of understanding. Something important to think about though..